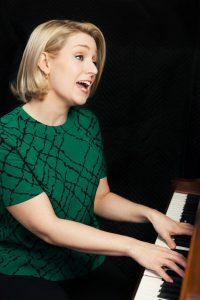 I run a private studio for voice and piano lessons in our home in New York City. My studio is our former dining room that has soundproof walls and a door. The entire area of the studio is 7’x12’ – smaller than the guest bathrooms of my friends in the suburbs! In a small room like mine, space is at a major premium and as a business owner, performing musician and mom I need to be organized to stay sane. In my studio I teach piano, voice, songwriting and musicianship to students of all ages, from young children to adults to high level professionals. Teaching all of these different subjects means that I have a lot of materials that I need to use on any given day. Jazz piano handouts, lead sheets, notated exercises, theory sheets, sight reading examples, and for my voice students I have all of their music too. And, I have to be prepared for anyone to come in at any time needing repertoire for auditions and performances (did I mention I’m also an accompanist and vocal coach?). I have to have thousands of songs at my fingertips at a moment’s notice. In my old studio when I was single and living alone in a huge apartment in a pre-war building, I taught in a large room that had a floor-to-ceiling bookshelf full of books, plus two four-drawer filing cabinets filled to the brim. When we moved to our current apartment, I ended up with a much smaller space, which meant that I had to drastically rethink my space. Once I got all of those materials into my space, there was barely enough room for my piano and the space felt stuffy and overwhelming. Not a particularly inspiring space for my students to feel creative in. I needed to make a change. NOW. My first step was to take everything out of the filing cabinet and put it into piles. There were SO.MANY.PILES. Once I had everything in a loose order, I made some big discoveries. I had duplicate, triplicate and even quadruplicate copies of almost everything. I had rough drafts and past edits of a lot the choral music and other music I had written over the years. In some cases, I have every draft I ever did. It was massive pile! I started out by sorting through everything I had and throwing out anything that I had duplicate or triplicate copies of. It turns out that I had hundreds of pages of duplicate music, that I was happy to let go of. Anything that was left over from the purge was neatly organized and put into labeled file folders. I had rid myself of 10 huge recycling bags, and was now down to only one file cabinet. Was this all I could do? I had heard of musicians using a tablet instead of hard copy sheet music and I was intrigued. As a matter of fact, Harry Connick, Jr had been doing this for years. I wondered if it was possible to go completely paperless. But how? I started out by scanning all the single-sided loose sheets using a commercial copy machine at the school I was teaching at. I would put a stack of papers in the top loader and zip-zap-zoop, it would save them all as a pdf, which I would email to myself. Every time I went in to teach, I would bring another stack, until I had finished. I then named and organized all these pdfs into files. In my “Music” file, I had folders for pop, jazz, music theater (arranged by voice types), etc. and in my “Education” file I had folders for jazz piano, theory worksheets, sight reading, etc. For the remaining papers that were double sided, of irregular size I switch to a bed scanner (I used an Epson Perfection V-300), where I would scan a few sheets whenever I had a few minutes here and there. I would often get some scanning in if a there was a last-minute cancelation or if a student was running late. I organized all the files into folder by types and backed the whole shebang to two external hard drives, because I never ever want to lose this material! (And I don’t always trust computers). Some of my folders are “Music”, where I have subfolders like Pop, Jazz, Choral, Music Theater and “Education” which contains Jazz Lead Sheets, Sight reading sheets and Theory sheets. 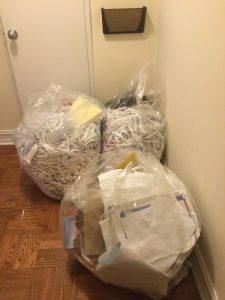 Once everything was scanned and organized, I shredded and recycled about 80% of that paper. I got rid of around 20 clear recycling bags of paper and emptied an entire 4-drawer filing cabinet and 8 storage boxes. It was incredible how much paper I had been storing that I didn’t even need. Everything is saved in my Dropbox app, which I can access via wi-fi on my iPad, my iPhone or any computer with internet access. I take my iPad with me when I go on tour, or if I’m teaching outside my studio and have no issues having my entire library with me at all times. I can easily print to my wireless printer (I use an Epson XP-330) or I can email the pdf to my student to print at home. I use the PDF Reader pro for all the material I use on a regular basis (forScore is also great), so I am able to access everything without needing a wi-fi connection. The app allows me to write on the scores to make note of key changes, tempo markings, etc. I have several folders organized by student names, plus a “work” folder which contains music that I am personally working on. I even bring the iPad to gigs, as I have PDFs of a bunch of Fakebooks. Was this a lot of work? Heck, yes! But I chipped away at it over the course of a single semester. And, I can firmly report that this has completely changed my life in so many ways. Thanks to my (almost) paperless studio, I discovered that I was wasting hundreds of dollars a year on photocopies I didn’t need to make, and sheet music I didn’t need to buy. Since I am organized now, it’s easy for me to find what my students need and then send them to sheetmusicdirect.com or musicnotes.com to buy their materials. I also have several packets of theory and jazz piano material that is ready to print wirelessly whenever I am working with a student. I no longer have to keep multiple copies of these materials, as I now just print as I go. Although it took some effort, going paperless was one of the best things I did for myself and my business. What steps have you made to make your business run smoother? Thank you SO much for sharing your experience with detailed, step by step instructions!!! I’d love to follow your step, and I have a few questions. 1) what device are you using, you said iPad. Is it Pro? Or regular one? Also, do you use your device only for the music? 2) When you have gigs with other players, what do you do? Do you print out the hard copies for them, or just send the players the pdf, or? I appreciate if you can answer them. And, congratulations on every accomplishment you’ve done! As a fellow LoVetrian, I’ve been being so inspired to say the least. Keep burning!